If you're like most people who live, or visit, around Phoenix, Arizona, you probably don't pay much attention to the rivers. 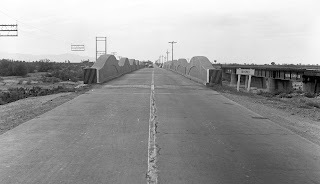 They've been crossed by bridges for a very long time, and if you notice them at all it might be just because of the name on a map. And since the rivers of Phoenix have always been washes (dry in the summer, wet in the winter, and muddy other times), seeing the word "river" can be confusing if you didn't know that. In fact, it would be reasonable to assume that New River had once been a mighty raging river, with ships sailing on it, until fairly recently when people flushed their toilets too many times, or something. No, it's been a wash for as long as the Sonoran Desert has been there, about 10,000 years. I notice the rivers. In fact, yesterday when I took the pic at the top of this post of New River, I intentionally walked behind the building that my friend and I were visiting (a frame store) to look at the river. And yes, that's what New River looks like - dirt and sand and rocks and some scrubby plants. And if you could time-travel back 100 years it would look the same. In fact, you'd have to go back to the last Ice Age, before the area became a desert, to see consistently flowing water, and lots of trees. You'd see sloths and Wooly Mammoths, too! If you're interested in what this area of the planet looked like back then I recommend that you visit the La Brea Tar Pits in Los Angeles (one of my favorite places!). Yes, Los Angeles is a desert, too, compared to when Ice Age animals lived there. So if you want to time-travel, and see what the pioneers of Phoenix saw, and the Hohokam people saw, there's no need to go to a museum. Just look at a river. 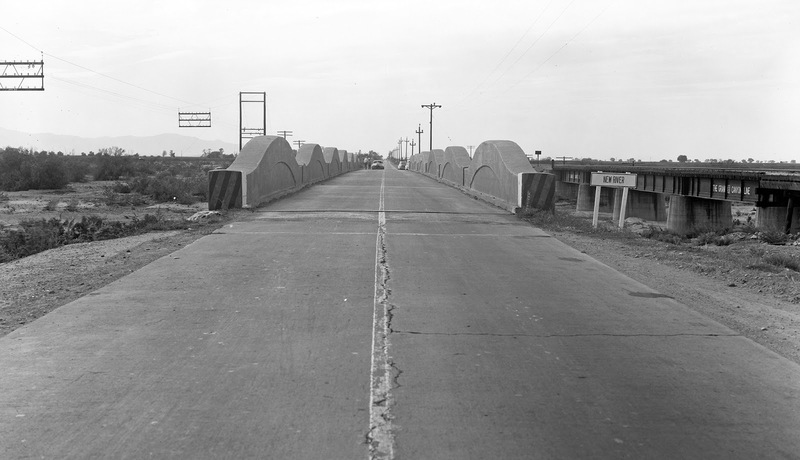 The bridge over New River on Grand Avenue in the 1940s, Peoria, Arizona. You're looking northwest. Image at the top of this post: New River in Peoria, Arizona. You're looking northeast.